Monarch acquired a 100% interest in the Swanson property from Agnico Eagle Mines Limited (NYSE:AEM, TSX:AEM). 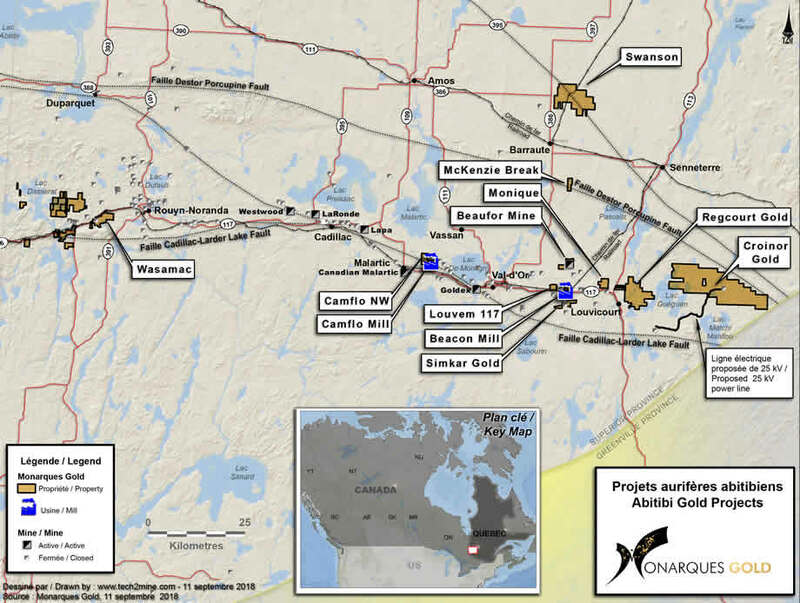 The property hosts a gold deposit located 65 kilometres from the Beacon mill and 12 kilometres northeast of Barraute, Quebec. It consists of one mineral lease and 129 claims covering a total area of ​​51.1 km2, as well as a 500-metre ramp down to a depth of 80 metres. The property is accessible year-round via Route 367 and a gravel road. A railway track also crosses the property, as does a transmission line. On June 20, 2018, Monarch Gold reported the results of a mineral resource estimate for its Swanson gold project. The resource estimate was prepared by Christine Beausoleil, P.Geo. and Alain Carrier, P.Geo., M.Sc., of InnovExplo Inc., both qualified and independent persons as defined by NI 43-101. The effective date of the estimate is June 15, 2018. The Swanson project mineral resource estimate for a potential scenario combining pit-constrained and underground resources at cut-off grades of 0.8 g/t Au (pit-constrained) and 2.7 g/t Au (underground) is summarized in the following table 1, whereas table 2 shows the sensitivity analysis of the Swanson maiden mineral resource estimate for the pit-constrained scenario. The 2014 CIM definitions and guidelines for mineral resources have been followed. The estimation encompasses four zones with a minimum true thickness of 2.5 m using the grade of the adjacent material when assayed, or a value of zero when not assayed. A high-grade capping of 30 g/t Au (4 g/t Au for the dilution envelope) was applied to assay grades prior to compositing grade for interpolation using an Ordinary Kriging interpolation method, based on 1.5 m composite for block size of 3 m x 3 m x 3 m.
Bulk density values were applied on the following lithological basis (g/cm3): I2 = 2.78; I4O, V3, V4 = 2.90, and OVB = 1.5. The number of metric tons was rounded to the nearest thousand and the metal contents are presented in troy ounces (tonne x grade / 31.10348). The 2018 maiden mineral resource estimate was prepared using Leapfrog GEO and GEOVIA GEMS software. Leapfrog was used for 3D modelling of the four mineralized zones while GEMS was used for grade estimation and block modelling. Statistical studies were done using Snowden Supervisor and Microsoft Excel software. The estimate was performed using 3D block modelling with the Ordinary Kriging interpolation method. The diamond drilling database contains the results of 146 surface and 63 underground drill holes provided by Monarch. Basic univariate statistics were performed on datasets of individual raw gold assays for each zone and for the dilution envelope. The capping (30 g/t Au) was applied on raw assays before compositing at 1.5 m.
The cut-off grades were calculated using a gold price of USD1,296/oz, a CAD:USD exchange rate of 1.28 and the following parameters: (a) pit-constrained scenario: mining cost CAD4.94/t, processing cost CAD27.00/t, General and administrative CAD4.00/t, pit slope of 50 degrees used during Whittle optimization; (b) underground scenario: mining cost CAD90.00/t, processing cost CAD27.00/t, General and administrative CAD10.00/t.